Back in December of 2008, artist and gallery owner Ken Marquis contacted me and asked me to participate in the “Landfill Project”. At the time, he had over 100 international artists on board; by now, the project has grown to over 800 artists! The idea was to salvage hubcaps, clean them up and give them to artists to have their creative way with them. I’ll never forget the day my hubcap arrived in the mail. There was much laughter in my house, as I pulled it from the box and tried to explain to my family that it was going to be an art piece. 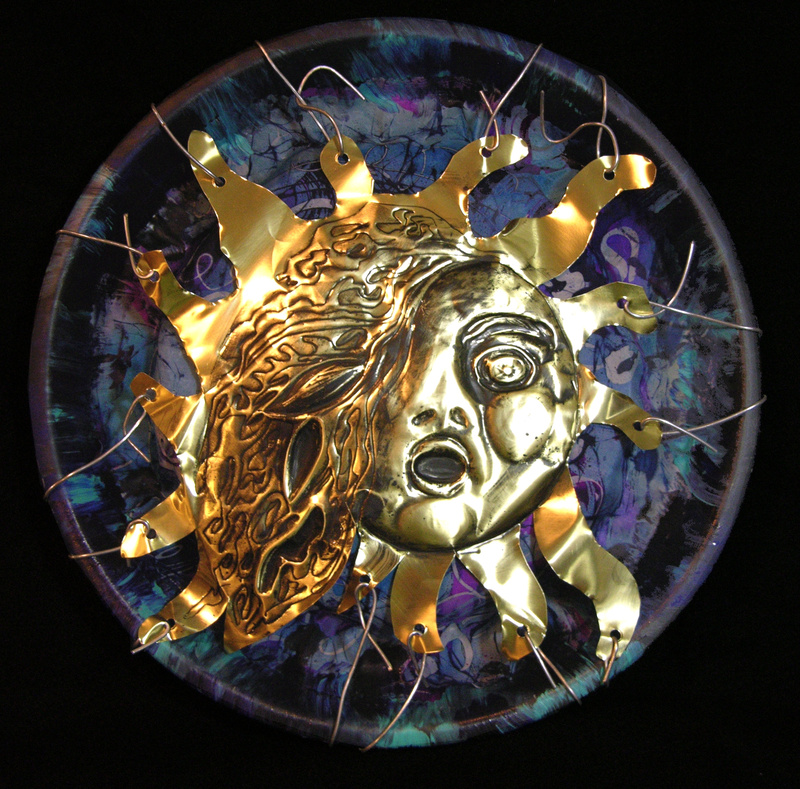 Ken Marquis’ idea sounded kind of crazy at first, but if you peruse the gallery of his hupcap art, you will be amazed at the inventiveness of artists from around the world, in re-imagining these metal disks. The take-away message for me is, why don’t we approach all of our environmental problems with this kind of creative energy? Landfill Art was just profiled in an AP article: Hubcaps As Canvas: Artists Turn Junk Into Jewels (where you can see my hubcap in slide #4). Ken needs 150 more professional artists for the project– see application and the complete “Gallery of Metal Canvases” at the Landfill Art website. This entry was posted in art for peace, artists you should know, Check out this show/gallery, creativity, environmental art, how to live, hubcaps, international artists, recycled art, repurposed objects, things I'm working on, things that work, Uncategorized. Bookmark the permalink. A great use for all those lost and discarded hubcaps. Definitely an environmentally sound project. Well done! Thanks for responding! It’s such an inspiring project and really gave me hope about the possibilities of creative problem solving for the big problems we create in our environment. Great idea! Good for our earth. It is, Shirley. I have to say that working on the hubcap to repurpose it as art got me thinking about other things that can be put to new uses, rather than discarded.